Grub2 File Manager helps you browse the list of devices and files, it also supports reading text files, opening ISO files and partition images. 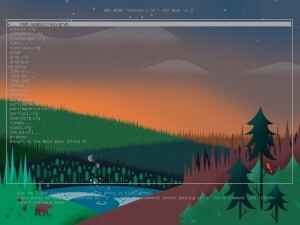 By using Grub2 File Manager, you can browse files and folders on all partitions on your computer. In addition to reading text files, it also supports booting from the files it supports. Boot the ISO, IMG and IMA file with Grub4dos. Boot WinPE 7/8/8.1/10 (.wim) via wimboot. Boot WinPE XP (.wim) and Windows VHD 10/8.1/8/7/XP (.vhd, .vhdx) with NTBOOT via Grub4dos. Boot Grub4dos via grldr and grub.exe file. Load configuration of Grub2 (grub.cfg) and Grub4dos (menu.lst). View images (.png, .jpg, .jpeg) by display as background. Open the ISO, PartIMG files and files that it supports to view the files and folders within it. For the files it supports, you can place these files anywhere on your computer and then access them for processing. You can put your ISO file (such as Ubuntu, Linux Mint…) on your hard drive and boot it from AIO Boot on USB. To quickly list files, you should copy them to the /AIO/Files directory, then press the j key from the Grub2 menu to quickly list these files. However, I recommend that you Integrate the files through AIOCreator.exe, unless you can not run it, or you are using Linux. From the Grub2 main menu, press d for quick access to the File Manager menu. You can use the ls command to list devices and files. Press c to enter commands. Use the loopback command for filesystem files. For example, the partition image file (PartIMG) and ISO (iso9660). The Grub2 File Manager also uses the cat and loopback commands to open the files.